Building fellowship and community among fellow travelers is just one of the ways you’ll connect spiritually on this biblical tour of Israel and Jordan. This journey will lead you in the footsteps of Jesus as you learn and hear stories about His ministry, His miracles and His life as well as included visits to some of the most cherished biblical sites. Along with key sites of biblical importance, such as Muhraka, Nazareth, Bethlehem, the Sea of Galilee and Cana, and Mount Nebo and Bethany Beyond the Jordan in Jordan, you’ll discover other sites to bring your faith to life. Being with fellow like-minded travelers to share this experience with, this faith-based vacation for the value-minded traveler is a vacation of a lifetime. On departures February 1, May 31, November 22, baptismal ceremony on the Jordan River instead of Qasr el Yahud and Cesarea Philippi. Buffet breakfasts daily, 9 dinners. Welcome to Israel! Check into your hotel, then this evening, meet your Tour Director and fellow travelers. Leave Tel Aviv and drive to the old port of Jaffa. Sightseeing continues at Caesarea, an ancient port turned stunning archaeological zone. Admire the restored 3,500-seat Roman THEATER, the aqueduct, harbor, and the crumbled moat and towers from the 12th-century CRUSADER FORTRESS. Next, visit MUHRAQA on Mount Carmel, site of Elijah’s contest of faith with the priests of Baal. From here, travel to the ARCHAEOLOGICAL SITE OF MEGIDDO, an age-old fortified town and site of the Battle of Armageddon in the End Times, according to the Bible. Stay overnight in the lakeside city of Tiberias. Today, travel to Kibbutz Ginosar to see the ancient boat at the JESUS BOAT MUSEUM, followed by a CRUISE on the Sea of Galilee. Next, visit Capernaum and see its ANCIENT SYNAGOGUE AND THE HOUSE OF ST. PETER. Travel north to the MOUNT OF BEATITUDES, where Jesus delivered his Sermon on the Mount, and continue to Tabgha to visit the CHURCH OF THE MULTIPLICATION, the site where Jesus fed 5,000 people with two fish and five loaves. On to Caesarea-Philippi (Banias), home to one of the springs of the Jordan River and a place where Jesus taught his disciples. This morning, stop in CANA, site of Jesus’ first miracle when he turned water into wine at a wedding. Continue to Nazareth and visit the CHURCH OF THE ANNUNCIATION, ST. JOSEPH’S CHURCH, and of the old village. Leave the Galilee area, drive through the Jordan Valley, and visit the Qasr el Yahud BAPTISMAL SITE, then ascend the Judean Mountains to Jerusalem, with a stop at a viewpoint overlooking the Old Town. Set off on a touching walking tour of Jerusalem’s Old Town. From the MOUNT OF OLIVES, take in memorable views over the city. Descend via the PALM SUNDAY WALK and visit the GARDEN OF GETHSEMANE, where Jesus prayed on the night before his arrest. Visit the CHURCH OF ALL NATIONS, located next to the garden, then enter through St. Stephen’s Gate and arrive at the POOL OF BETHESDA. Follow in Jesus’ footsteps along the Way of the Cross to the CHURCH OF THE HOLY SEPULCHRE. Walk through the JEWISH QUARTER, reconstructed following unification of the city after the Six-Day War in 1967. Stop at Mount Zion to visit KING DAVID’S TOMB and the CENACLE—the Upper Room where Jesus and his disciples had the Last Supper. View the unearthed colonnade-style thoroughfare with its ancient marketplace. 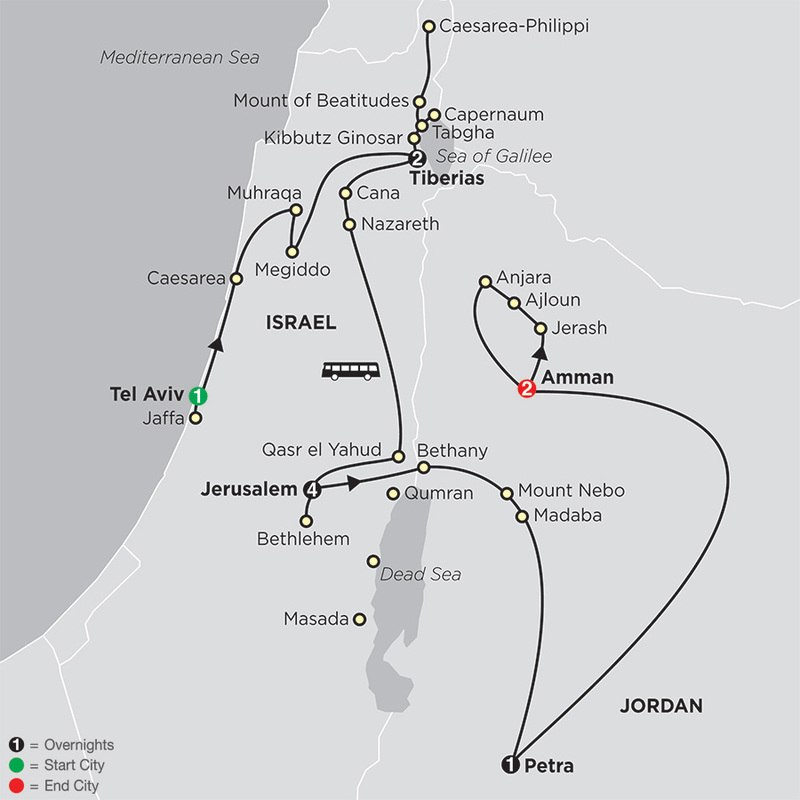 Travel to Bethlehem, birthplace of Jesus and King David. Visit one of Christianity’s holiest places, the CHURCH OF THE NATIVITY, situated on the site where Jesus was born. Today is free to relax, revisit some of the Jerusalem sites at your own pace, or join an exciting optional excursion to the Dead Sea, the planet’s lowest point on dry land. Travel to Qumran with an included visit to the Qumran Caves, where the Dead Sea Scrolls were discovered. 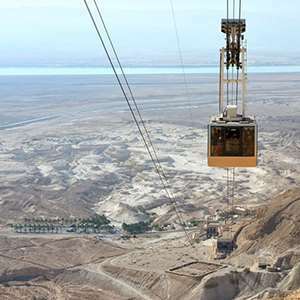 Continue to Masada and ride the cable car up to the magnificent rock fortress, on a clifftop above the Dead Sea, where 960 Jewish rebels made their last stand against Roman forces in 73 AD. Later, head for the shores of the Dead Sea, where you’ll have time to experience the incredible buoyancy in the salt water. Return to Jerusalem. Drive to Allenby Bridge, where you will cross into Jordan and arrive at BETHANY BEYOND THE JORDAN, where Jesus was baptized by John the Baptist. On to MOUNT NEBO, where Moses saw the Promised Land and where he is believed to be buried. Next, travel to ancient Madaba, the “City of Mosaics.” Later, see the spectacular BYZANTINE MOSAICS and the precious 6th-century mosaic map of the Holy Land, and visit ST. GEORGE’S CHURCH.